Roaring Brook Press, 9780761315841, 176pp. Set in the terrifying aftermath of the eruption of Mount Vesuvius, the third book in this highly praised mystery series takes young sleuth Flavia Gemina and her friends in search of pirates and slave dealers. A fast-paced whodunnit that combines action, well-placed clues, and strong female lead, and a well-realized ancient Roman setting, this is a treat for mystery lovers and history fans alike. Caroline Lawrence has degress in classical archaeology and Hebrew and Jewish studies. She lives in London, England. 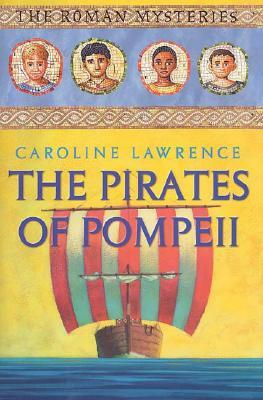 Publishers Weekly Flavia Gemina, the teen sleuth of first-century Ostia and heroine of the Roman Mysteries series, cracks her third case in The Pirates of Pompeii by Caroline Lawrence. Mount Vesuvius has just erupted, and refugees stream into camps-where children go missing. Booklist This third book in the Roman Mysteries series continues the first-century B.C.E. adventures of teen sleuth Flavia and her sidekicks. This title begins in a refugee camp in the aftermath of Vesuvius' eruption. While assisting the camps' doctors, Flavia and her friends discover that many children have disappeared in the chaos. Suspecting a kidnapping plot, the friends investigate, and their inquiries lead them to the opulent villa of a wealthy, charming nobleman. Is he behind the kidnappings? The friends discover the answer in a series of terrifying near-death adventures. As in the series' previous titles, Lawrence combines vivid period details and graceful imagery with a thrilling pace and some gory action scenes, always portraying Flavia and her friends as well-drawn young people whose playfulness, jealousies, outrage, and courage will resonate with contemporary readers. Additional themes of slavery and class issues add depth to the plot, while a glossary defines the many Roman terms used throughout. School Library Journal Flavia, Jonathan, Lupus, and Nubia are once again faced with a mystery. The year is 79 C.E. and Mount Vesuvius has just erupted, leaving chaos and destruction in its wake. The children are living in a refugee camp with Jonathan's father and Flavia's uncle. The sky is hazy and red, everything is covered in a thick layer of ash, and the wails of professional mourners and families who have lost loved ones pierce the air. One by one, children disappear from the area and Flavia and her friends decide to find out why. Woven into the mystery are problems and issues of Roman life such as the abusive treatment of slaves and the class structure of the patron/client system. The search for the missing children is fast paced and in several instances peril seems imminent. Newcomers to the series may be a little confused by this one but fans will enjoy it.